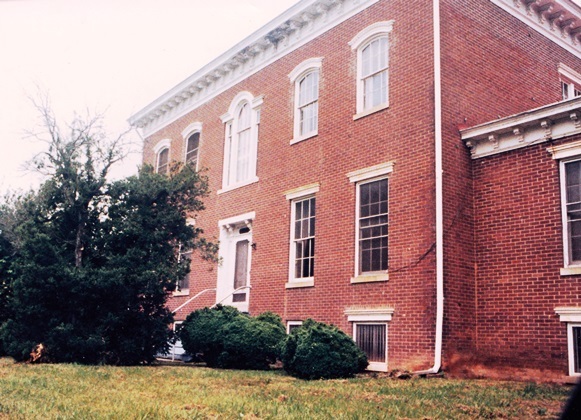 Windsor, the beautiful old brick home located in the valley of the Dan River, was started in 1850. The bricks for the main house and outbuildings were made by hand by slaves, and the lumbar was cut from the virgin forests. Work on this Georgian-style house continued until 1860 when the family moved in before it was completed. The next year the Civil War started, and work on the house ceased. Columns for the front still remain under the back porch, some never uncrated. Even so, it was one of the most beautifully constructed homes in the area. 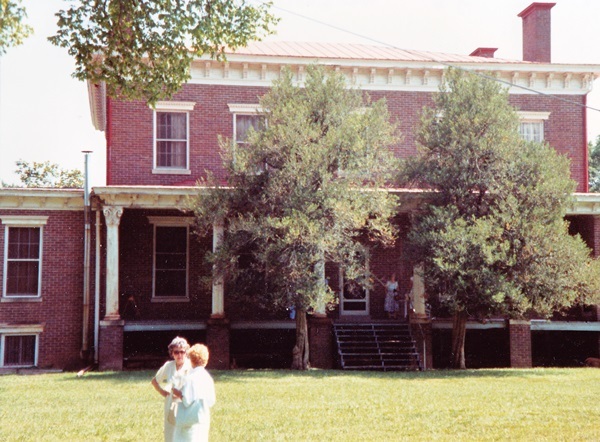 Photo taken at family reunion in 1990 by Robert E. Hairston, Jr. This large home has twenty rooms with the two parlor rooms measuring twenty feet square. The mantle in the back parlor is Carrar marble from northern Italy, and the wall-to-wall rugs are the originals from Aubussau, France. The Samuel Pannill Wilson family owned Windsor and are the third generation to have lived here. The portraits which were painted in 1851 are William Brown's. Much of the original furniture remains; however, the dining room furniture is from "Oak Hill", another estate which was once owned by the Hairston family The formal gardens, which once covered seven acres, were destroyed nearly a half-century ago. One of the most striking attributes of the estate is the way that the outbuildings were set at right angles to each other and the house, and also the quality of the construction which marks even the chicken house. The house and all the outbuildings have granite sills and steel caps over the windows. Windsor had two dining rooms. The family dining room was in the basement and was used except on the most formal occasions. This home has many modern conveniences; for example, each room had a bell pull, which rang in the servant's quarters in the basement. Each room had a different toned bell so as to be distinguishable from the others in the house. It also had a gashouse where gas was generated to burn in the lights at Windsor. This wonderful home was called the "Garden of Eden" of all homes in the area. Windsor was built by Samuel Pannill Wilson (1822-1894) for his bride Ruth Stovall Hairston (1827-1888). She was the daughter of Samuel Hairston (1788-1875) and Agnes John Peter Wilson (1801-1880). Samuel Hairston was the son of George Hairston and Elizabeth Perkins.